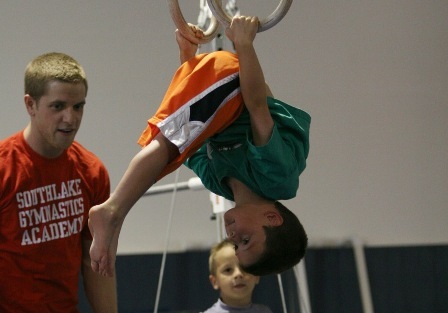 The developmental part of Southlake Gymnastics Academy's program focuses on developing a child's fine and gross motor skill as well as self-confidence. We emphasize fun and excitement while the class concentrates on developing a core group of basic skills on all six Olympic events: floor exercise, pommel horse, still rings, vault, parallel bars, and high bar, as well as trampolines and foam pits. The director of the Developmental program coordinates the week-to-week activities, the events, and the skills the classes are working on so that they remain fun and progressive for every child.